These are ten of the exercises that I used to heal my own traumatic brain injury. If you want to improve your mental function, these ten exercises are the best way I know of. Yes, I'd like to receive resources and information from The Aware Show. I understand I can unsubscribe at any time. In the “every person” role, Lisa’s questions and concerns emerge from her own life as a business owner, parent, sibling, and friend. In representing the listeners’ personal interests, Lisa draws information from her guests that she — and everyone else — can use profitably in their lives. Aware is dedicated to communicating information to inspire positive growth and change. Our goal is an increased awareness and healing on an individual and planetary level. Based on our commitment to the renewal of the human spirit, and combined with our pure faith in the power of love, we are answering a call to action for a more conscious world. The first step toward change is Awareness, and listening to the radio show interviews will provide a daily oasis for you to immerse yourself in life-changing information. Listening to these shows will shift you from any space you are in to one of inspiration, while learning information, practical tools and experiential exercises to change your state and keep it that way. Listen and Enjoy! Dr. Loretta Breuning is the founder of the Inner Mammal Institute and the author of Habits of a Happy Brain which covers how you can retrain your brain to boost your serotonin, dopamine, oxytocin and endorphin. She started researching the roots of human motivation when she was frustrated by her results as a teacher and mom. When she learned about the brain chemistry we share with earlier mammals, everything made sense and she began creating resources to help people manage their inner mammal. For all sorts of educational support, visit her website at www.innermammalinstitute.org. According to the CDC, one in 10 Americans over the age of 12 takes antidepressant medication. So what’s going on inside our heads that is making us feel so sad? And wouldn’t it be nice to have power over our brains so we can boost our happiness quickly and without drugs? We can, when we understand Mother Nature’s “nudge” mechanisms. And to educate us all about this today is Dr. Loretta Breuning, author of Habits of a Happy Brain: Retrain Your Brain to Boost Your Serotonin, Dopamine, Oxytocin, & Endorphin Levels. Tune in and find out how to have a happy brain! According to the CDC, one in 10 Americans over the age of 12 takes antidepressant medication. So what’s going on inside our heads that is making us feel so sad? And wouldn’t it be nice to have power over our brains so we can boost our happiness quickly and without drugs? We can, when we understand Mother Nature’s “nudge” mechanisms. And to educate us all about this today is Dr. Loretta Breuning, author of Habits of a Happy Brain: Retrain Your Brain to Boost Your Serotonin, Dopamine, Oxytocin, & Endorphin Levels. Tune in and find out how to have a happy brain!You need to log in or become an Aware Community member to listen to this play back. You should assume that the owner of this website is an affiliate for providers of goods and services mentioned on this website. The owner may be compensated when you purchase after clicking on a link. The owner may also have received the product for free. Perform due diligence before purchasing from this or any other website. Send me the FREE Gifts! These ten scientifically-backed exercises can improve your cognitive function, memory, and mental processing power. 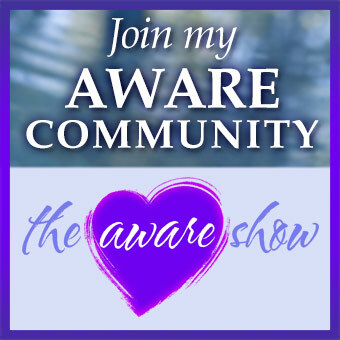 *By clicking "Subscribe" you are agreeing to receive emails and content sent to you by The Aware Show.